The group were kicking off their campaign to ask politicians to support an industry fund that will provide care and support to victims of deadly mine dust diseases. 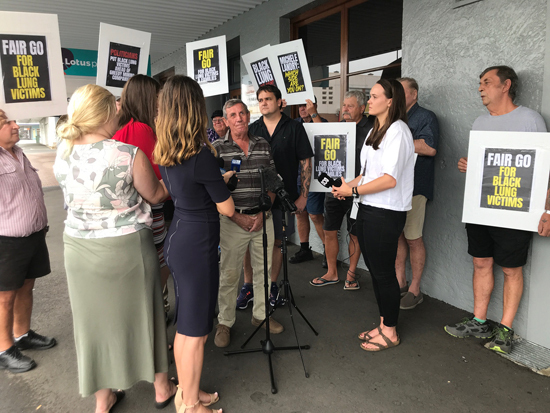 Victims’ advocate Jim Pearce – a former coal miner and Queensland State MP – says that it is vital for local politicians to get behind the campaign. “The big mining companies won’t do this on their own. They’re only interested in protecting their bottom line, not in protecting the workers and families who are risking their lives in the coal mines. “Mine dust diseases are debilitating and often deadly. 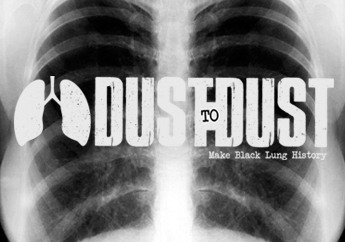 What’s more, the number of new victims suffering from dust-related diseases, such as silicosis, is growing. “Up to 100 mineworkers are already paying a horrific price with deteriorating health and treatment costs. “It is unfair that these mine workers who have been sent into the coal mine to do a job, didn’t have the protection in place to look after them. Mr Pearce said the Mine Dust Victims Support Group was proposing a modest 1 cent per tonne, per week levy on coal produced to go into the fund for sick workers and their families. “This ask is not radical or unreasonable. In the US, coal companies pay a $US1.10 per tonne levy on each tonne of coal produced to assist mine disease victims. “In Australia, the James Hardie Fund has distributed more than a billion dollars to asbestos victims. “Some of Queensland’s coal operators are among the biggest and most profitable mining companies in the world. Our proposal would hardly be a blip on their radar. Despite being given the brush off by Michelle Landry and the mining companies, the Victims Group has not given up and will keep up their campaign for the Mine Dust Diseases Victims Fund.